As a building owner or property manager, you want to minimize the total cost of ownership of your property by maintaining your roofing system, upgrading insulation or even starting a maintenance program. You know that properly maintaining your roof is not only an insurance policy for your business but also an opportunity to increase the value of one of your largest assets. Your commercial roof provides a safe haven for yourself, your tenants and employees. 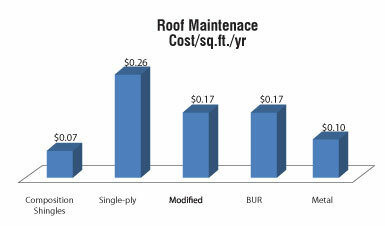 Timely repairs can save you the huge expense of new roof installation. Routine repair prevents extensive damage: Your roof not only covers your building but protects its structural integrity as well. Roof leaks can lead to water damaged walls, destruction of interior finishes and furniture, and encourage the growth of unhealthy mold and mildew. Routine inspection and repair can prevent personal and related injuries and expensive roof replacement. Noticing leaks and facade cracks are clues that you may have a problem with your building’s envelope. But these tell-tale signs shouldn’t be your first clues. Establishing and implementing a quality, ongoing exterior maintenance program will clue you in to building problems early enough to take action. While it may be a cliché, it’s entirely true that few things are more important than keeping a solid roof over your head. And like any other aspect of a building’s structural composition, your roof has a life span that is dictated by time, wear-and-tear, and environmental conditions. On average, a roof that is properly maintained lasts longer and is less vulnerable to leaks. If damage from the sun, wind, snow and rain are left unchecked, the result will be leaks and serious damage to other parts of the building, like the facade, the stairwells and the windows. While leaks normally start slow, they can create ideal conditions for rot, mold, and fungus to grow in attics and wall framings, which is not only costly to eradicate, but can also pose a dire heath hazard for residents. Given the high stakes, it’s important to know what type of roof is over your head, its current condition, and the terms of its warranty. For most buildings, and depending on which system is used, a roofing manufacturer will normally give a 20-year warranty, although some will give 10-, 15- or 25-year terms. Regardless of the length of the warranty, the reason for the respective period of time, is that most roofs are built to last for longer than the warranty stipulates. If they give a 20-year warranty, that means it will probably last for 30 years because these roofs are tested, and no manufacture is going to stick their necks out. Some companies like CertainTeed, for example, have several roofing products for which they offer 50-year or lifetime warranties, but it depends on the product and the type of roofing material being installed. While some industry experts recommend hiring a reputable roofing contractor to examine a roof every year or two, this job should really be done twice a year, usually in the spring and fall – after the ice thaws and again before the snow starts. Ice causes building materials to expand and contract, which can weaken seals and lead to leaks. Heavy snow, on the other hand, adds weight, which may also cause problems if roof surfaces warp and buckle under the load. Both scenarios are hard to avoid, and can seriously compromise a roof’s integrity. The best way to preserve a roof is to conduct biannual inspections to check for damage and take preventive steps before bedrooms turn into pool rooms. When it comes to roofs and leaks, you have to be a detective, like Colombo, and keep asking questions. This entry was posted in Commercial Roofing Contractor, Commercial Roofing MN and tagged commercial roofing mn, commercial roofing options, commercial roofing system, Minnesota commercial roofing contractor, mn commercial roofing company, roof inspection, roof maintenance, roof repair mn, roof replacement. Bookmark the permalink.